“Through seasoned management, exploration expertise, potential partnerships with larger companies and a well-funded treasury, Aztec Minerals has what it needs to unfold the discovery potential of these two properties,” Cooke noted. Aztec Mineral’s core asset is the prospective Cervantes porphyry gold-copper property in Sonora, Mexico. Northwest Mexico is home to some of the largest porphyry copper-molybdenum-silver-gold deposits on the world, for example, Grupo Mexico’s Cananea and La Caridad mines. Southeast Sonora hosts two large open-pit epithermal gold mines, Alamos Gold’s Mulatos Gold Mine (2.0 million ounces remaining) and Agnico Eagle’s La India Gold Mine. 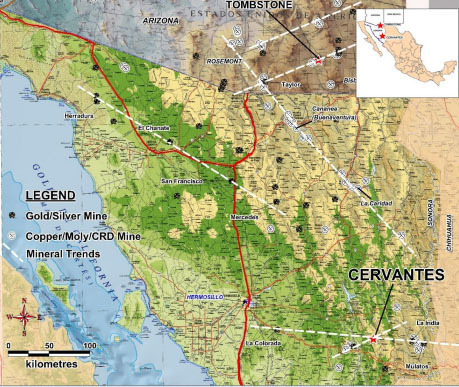 Cervantes is located 160 km east of Hermosillo at the crossroads of one of the NW trending copper trends and the EW Mulatos gold trend. The property is accessible by road. “Aztec successfully negotiated community support and land access through its attention to the needs of the local ranchers. Best safety and environmental practices were used during the Phase 1 drill program,” Cooke stated. Since Cervantes was only explored by a small, shallow drill program in the mid-1990s, Aztec had reason to believe the area was significantly underexplored and held strong discovery potential. “In late 2015 and early 2016, the company identified robust and coherent gold, copper, and moly anomalies by soil sampling. An induced polarization survey over the heart of the gold-copper-moly anomalies in 2016 delineated a large, strong, open-ended chargeability anomaly that confirmed a larger copper-gold porphyry target below an oxide gold cap,” Cooke noted. In 2017, the company obtained a drill permit and all required surface agreements. A Phase 1 drill program was completed in late 2017-early 2018. In total, Aztec Minerals drilled 2,675 meters in 17 holes. Aztec also won a government land lottery and acquired two new mineral concessions covering approximately 3,149 hectares adjacent to the Cervantes property. Mapping and sampling has outlined an additional seven prospective target areas and more soil and rock chip samples were collected for a total of 1,111 samples. In June 2018, the company announced that it completed its phase 1 drilling. Per the table below, drilling results shows 160 meters grading 0.77 gpt gold, including 80 meters of 1.05 gpt gold, 0.11% copper and 4.0 gpt silver in drill-hole 18CER010. Aztec noted that a Phase 2 drill program will focus on testing the large, strong IP anomaly lying below and beyond the surface oxide gold cap, as well as some reconnaissance drilling at some of the other seven prospect areas. Management says the project has caught the interest of several major mining companies and discussions are underway with regard to a possible option and joint venture with a big partner. The Tombstone Project is another asset of Aztec Minerals. Tombstone is a historical silver-lead-gold-copper-zinc mineral district in southeastern Arizona. Discovered in 1877, the area became known for its high-grade, oxidized, carbonate replacement deposits (CRD) of silver-gold-lead mineralization. The Tombstone Project is close to numerous world-class porphyry copper deposits in addition to the newly discovered Taylor zinc-lead-copper-silver-gold “CRD” sulphide deposit. Furthermore, management believes “potential high-grade, bulk tonnage CRD could lie below the Bisbee Group in the underlying Paleozoic limestones.” This shares a similar geological setting to the Taylor deposit of Arizona Mining, located only 65 kilometers southwest of Tombstone, which recently completed a CA$1.8-billion friendly takeover by South 32. Aztec launched a CA$139,000 phase 1 exploration program at Tombstone in August 2018. It includes structural and geological mapping, soil and rock sampling, trenching and airborne geophysical surveying. The data will be used to model both shallow and deep CRD targets. Big plans are ahead for the Tombstone Project, and management says that it has no plans to slow down. Aztec Minerals is working with an experienced management team who have established track records for making discoveries and building mines. Chairman Bradford Cooke alone boasts 40 years of experience in the mining industry, including 15 years as the founder and CEO of Endeavour Silver Corp., a successful mid-tier silver mining company. President and CEO Joey Wilkins, B.Sc, P. Geo, has 30 years of experience exploring throughout the Americas. Wilkins is backed by a CFO and VP, Investor Relations who bring over a half century of combined experience in the field. After being publicly listed at CA$0.35 per share, AZT shares currently sit at CA$0.15 per share for a market capitalization of only CA$4.2 million. The company has 27.9 million shares issued and outstanding, or 38.9 million fully diluted. Insiders hold 17.9% of the fully diluted shares, Chairman Cooke has recently been purchasing shares in the market and Coeur Mining is a strategic investor with a 9.9% fully diluted stake. 5) From time to time, Streetwise Reports LLC and its directors, officers, employees or members of their families, as well as persons interviewed for articles and interviews on the site, may have a long or short position in securities mentioned. Directors, officers, employees or members of their immediate families are prohibited from making purchases and/or sales of those securities in the open market or otherwise from the time of the interview or the decision to write an article until three business days after the publication of the interview or article. The foregoing prohibition does not apply to articles that in substance only restate previously published company releases. As of the date of this article, officers and/or employees of Streetwise Reports LLC (including members of their household) own shares of Aztec Minerals Inc., a company mentioned in this article.